Roll ups can be used in conferences, retail and shopping malls, Brand activations, near the reception and even at exhibitions for additional branding and attractive stall design. Banners are cost effective portable displays with multi-functional capabilities. They grab attention for your brand at events, conferences and brand activations. 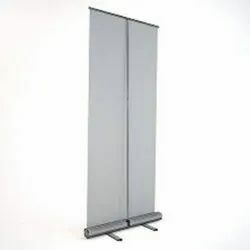 Insta Banners comprise of aluminum tripod stand with graphic panels integrated on flex or fabric medium. The portable display packs in a sturdy carry bag.